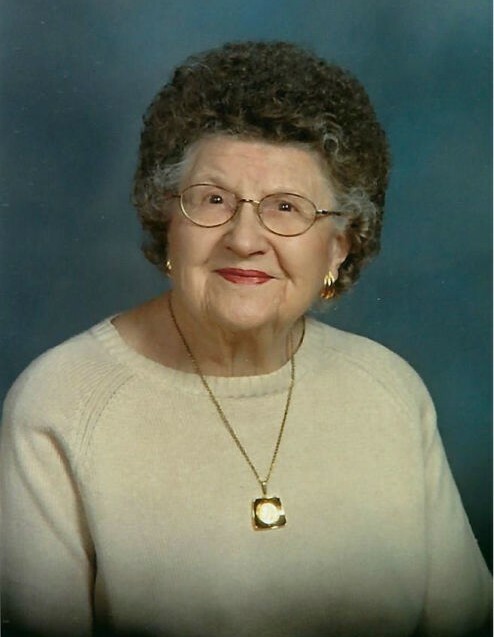 Elveda E. Hansen, age 103, of Escanaba, passed away Saturday evening, January 19, 2019 at Christian Park Village in Escanaba. She was born on June 25, 1915 in Garden, MI, the daughter of Truman and Eugenia (Beck) DeLoria. Elveda grew up in Escanaba and graduated from Escanaba High School in 1933 as the class secretary and member of National Honor Society. Elveda began working at Northern Motors and then began her lifelong career at Ludington Motors as the bookkeeper for 47 years until her retirement at the age of 73. The former Elveda E. DeLoria married Eugene Walter Hansen on July 20, 1936 in Menominee and he preceded her in death on December 29, 1967. Together, the couple shared 31 years of marriage and raised 3 daughters, Sonia, Lynne, and Lori. After Elveda’s husband passed away, she volunteered and was very active with the Delta County Cancer Alliance. She was a longtime member of the First Presbyterian Church in Escanaba where she was in charge of assigning the greeters. Elveda was also part of the Presbyterian Women’s Association and served as treasurer for many years. She loved knitting and enjoyed getting together with her club friends monthly. Family always came first and was proud being the oldest of six generations. Elveda E. Hansen is survived by daughters, Sonia (Gerald) Nelson of Escanaba, Lynne Magnuson of Escanaba, and Lori (Robert) Bolm of Sandy Hook, VA; “special daughter”, Jill (Ward) Johnson of Escanaba; 8 grandchildren; 17 great-grandchildren; 33 great-great-grandchildren; and 1 great-great-great-grandchild. In addition to her parents and husband, Elveda was preceded in death by son-in-law, Ron Magnuson; and great-great-grandson, Jack Wetton. Visitation will be held from 1:00 p.m. to 3:00 p.m., Saturday, January 26, 2019 at the First Presbyterian Church in Escanaba. Funeral services celebrating the life of Elveda will follow at 3:00 p.m., Saturday, with Rev. Kyle Segars officiating. A luncheon will be served at the conclusion of the services in the church fellowship hall. Burial will take place in the Gardens of Rest Cemetery. In lieu of flowers, the family requests memorials to please be directed to the First Presbyterian Church or the Delta County Cancer Alliance.